ETHNO WORLD 6 Instruments is the summit of a library that has continuously grown and been improved over a period of 16 years. In this sixth edition, numerous new instruments with a volume of several gigabytes have been added to the library. Award-winning film composer Marcel Barsotti has gathered a gigantic selection of instruments from all over the word and has additionally recorded a wide choice of solo-voices and choirs from widely varying cultures. 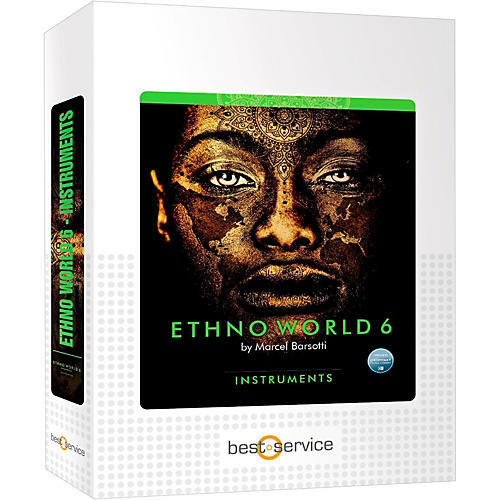 ETHNO WORLD 6 Instruments now consists of 264 instruments, being summarized in approximately 620 patches, 10 construction sets and 5 shaker sets. For the most authentic sound, the instruments have been recorded with different play techniques that can be easily and precisely accessed from the patches by key-switches. The library consists of 24.7 GB (uncompressed) of sample data and 23,559 samples. All instruments are delivered in a resolution of 24 bit and 44.1 kHz. For the recordings that have been carried out under the direction of producer Andreas Hofner, over 70 musicians and singers from all over the world were involved. Recordings took place in different local studios with the use of first-class gear such as microphones by Neumann and Brauner, SPL preamplifiers and converters by RME. ETHNO WORLD 6 Instruments comprises an incredible spectrum of instruments and voices from the most diverse regions of Asia, Africa, Europe, North- and South-America. Here, you will find the fitting instruments and voice-recordings for folkloric, ethnic as well as for modern music.